Offered is a very nice early American coin silver teaspoon by noted Philadelphia silversmith and jeweler Nicholas Le Huray (or LeHuray) Jr., working circa 1821-46 in that city. Nicholas Junior's work is always desirable and usually very finely done. 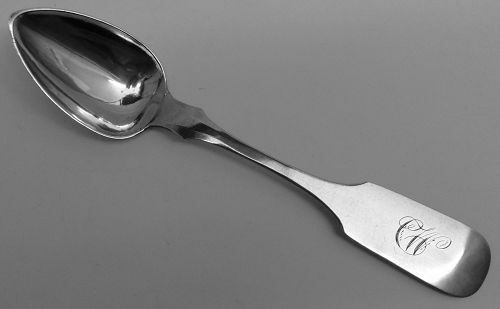 This spoon is no exception, with a lively period engraved script monogram, and nice proportions. Please scroll through all the pictures by clicking on the first picture. This spoon measures about 5 3/4 inches in length and weighs about 13 grams. Condition is very good overall, with only modest wear from normal use and no splits or repairs. All in all a lovely example of Philadelphia coin silver by a great maker!